The first day of the Syed Mushtaq Ali T20 trophy witnessed some upsets and some wonderful performances. Virender Sehwag flopped while Wriddhiman Saha and Mohammed Shami helped Bengal to a convincing win. Services produced an impressive all-round show to beat Karnataka by three wickets in a Syed Mushtaq Ali Trophy. Chasing 122 for a win, Services overhaul the target with six balls to spare in the Group D match at Barabati Stadium. Sent into bat, Karnataka could only score 121 for 9 in their allotted 20 overs as a disciplined Services bowlers stifled them from scoring. Pacer Antony Dhas and leg-spinner M Ashwin shared seven wickets between them as Tamil Nadu thrashed Haryana by nine wickets in their opening group A match of the Syed Mushtaq Ali Trophy Twenty20 in Nagpur. Virender Sehwag was dismissed after adding just three runs to the military medium pace of Rajagopal Sathish. The swashbuckler, who retired from international cricket last year, is playing this tournament as part of his preparations for the upcoming Masters Champions League. Ishwar Pandey ripped apart the rival top-order with a four-wicket haul as Madhya Pradesh overwhelmed Andhra Pradesh by five wickets. Pandey vindicated his captain Naman Ojha's decision to field first as he reduced Andhra Pradesh to 22 for four inside five overs with a four-wicket burst. Andhra could never recover from that assault and only four of their batsmen could manage double digit score with Sirla Srinivas being the top-scorer with 22. All they managed was only 95 on the board. Mumbai produced a disciplined bowling display to notch up a comprehensive six-wicket victory over Odisha in a weather-hit match in Cuttack. Electing to field, Mumbai dismissed Odisha for a paltry 91 in 17.4 overs and then returned to overhaul the target in just 15.5 overs in a match that was reduced to 18 overs a side due to inclement weather. Batting first, Bengal scored a healthy 185 for 4 in 20 overs courtesy Wriddhiman's 47-ball-81. In reply, Hyderabad were all out for 124 in 16.2 overs with Shami being the pick of the bowlers with figures of 3/18 in 2.2 overs. He got good assistance from the seasoned Pragyan Ojha (3/23 in 4 overs). Bengal got four points by virtue of this win. Piyush Chawla returned with a four-wicket haul to guide Uttar Pradesh to a comfortable seven-wicket win over Maharashtra in a weather-hit Group D match. A collective effort by Delhi's batsmen ensured that they comfortably chased down a mammoth Railways total with 4 wickets in hand in the opening group C match. Railways scored 210 for two in 20 overs on one of the flattest of decks with No 3 batsman Saurabh Wakaskar scoring 118 off 55 balls with seven boundaries and 11 sixes. He added 185 runs with former RCB player Asad Pathan (85). Two of Delhi's most consistent bowlers -- left-arm spinners Manan Shama (0/55 in 4 overs) and Pawan Negi (1/48 in 3 overs) were taken to task by Wakaskar. However Delhi chased down the target in 19.2 overs as almost all the batsmen save skipper Gautam Gambhir (10), who is out of form, scored runs. Opener Unmukt Chand started the chase with a 19-ball-38 with four boundaries and three sixes. Nitish Rana with a whirlwind 34 off 15 balls that included four sixes also played his part. But it was young right-hander Aditya Kaushik, who impressed one and all. with 53 off 36 balls that included five boundaries and a six as he held the innings during middle overs. Rohan Prem struck an unbeaten 59 to power Kerala to a five-wicket win over Jammu and Kashmir. Chasing 127 for a win, Kerala overhauled the target with eight balls to spare, thanks to Prem's 54-ball 59 not out. Prem hit six fours and a six in his unbeaten knock. Set a decent 152 to win, Himachal Pradesh overhauled the target with three balls to spare with five wickets in hands. Chopra's 89 came off 62 balls with seven fours and two sixes after his side had lost other opener Ankush Bains in the very first ball of the chase. With Paras Dogra (36), Chopra raised a 90-run stand for the third wicket and that proved crucial in the outcome of the match. 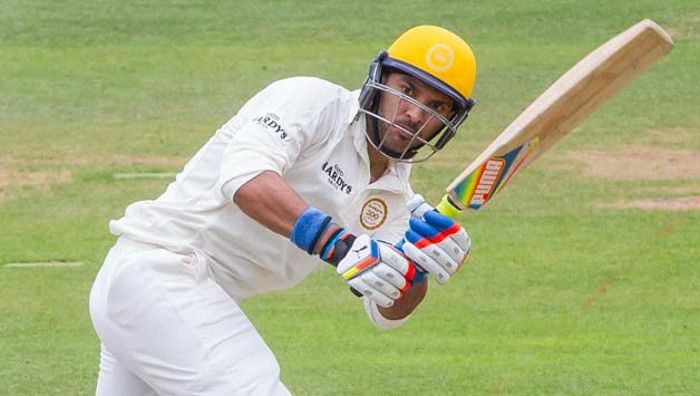 Yuvraj Singh failed with the bat as minnows Rajasthan shocked Punjab by four wickets in a group B encounter. Batting first, Punjab managed a paltry 130 for six in 20 overs with Mandeep Singh smashing 76 off 52 balls with seven fours and three sixes. Yuvraj (2) was dismissed by a slower delivery from Rajat Bhatia, caught by Rajesh Bisnoi. Save Mandeep, only Gurinder Singh (29*) crossed the 20-run mark. Bhatia again proved his skills as slow medium pacer in this format with figures of 2/16 in 4 overs. Irfan Pathan served a reminder to the selectors with a five wicket haul as Baroda crushed Assam by 49 runs. Pathan recorded career-best T20 figures of 5/13 in four overs as Assam were restricted to 116 for 9 in 20 overs reply to Baroda's decent score of 165 for eight.